A delicate and stunning set, this Organic Upscale Diaper Pound Cake and matching Diaper Cupcakes will make an exquisite addition to a baby shower decor. 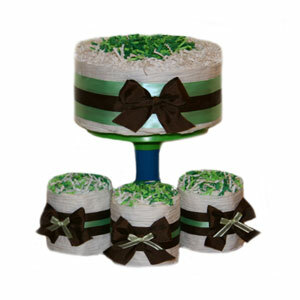 Originally created for a custom order, this diaper cake set will charm the mom to be. Decorated with high end ribbon and glazed with whip cream, you will have to remind yourself that these diaper cupcakes are not edible! Exclusive to GrowInStyle, our Upscale Diaper Cake set is baked with approximately 45-50 Eco Friendly Nature BabyCare Diapers (Size 1) and Weleda Baby Care Trial Size cream. Add our 3 Tier Organic Upscale Diaper Cake with an Upgrade option to this set and mom to be will have the most unique and memorable gift one can have.